This article was originally published in the Red River Valley Echo newspaper. There’s no doubt about it, energy is at the center of our society - from powering the production of the food we eat, to heating our houses and fueling our cars. There’s no denying that the oil and gas sector currently plays a central role in our national economy. At the same time, our reliance on oil and gas presents many challenges for our communities and our environments. Faced with these challenges, societies here in Canada and around the world are beginning to diversify the way energy is produced and gradually shift beyond oil and gas. As a young person, I am both intimidated by the monumental task of transitioning our energy systems and excited by the opportunities that lie in new energy economies. We have the chance to create new energy sources which work not only for us, but for our children and their children. Looking to the energy systems of the future, I believe it is critical that we make the transition in ways that prioritize the health and longevity of our communities and our environments simultaneously. My dual interest and concern regarding our energy systems has led me to volunteer with an organization called the Manitoba Energy Justice Coalition (MEJC). MEJC is a community-led network of concerned citizens and supporters across the province who are joining together to stand up for fair and accessible energy that prioritizes the interests residents and taxpayers above those of corporations. We work to defend the lands, air, and waters in Manitoba by promoting social and environmental justice in the energy sector. For me, this is a matter of consideration - who and what are we considering as we transition to new energy systems? I believe we must consider the communities who have traditionally stewarded the territories and resources here in Manitoba; consider long term employment needs and trends; consider the rivers and lakes that will provide drinking water for our grandchildren. As a community-led group, a critical part of the work we do as MEJC is having conversations with communities about energy development and use in the province, and how we can collectively shape our energy future. From hydropower to oil and gas development, we are working to support communities and ecosystems that are bearing the greatest burden of energy projects, and to understand the choices we have to lessen the impacts of these developments. The work hinges on the recognition that we, citizens of Manitoba and Canada, have the power to influence these critical decisions. When we discuss a fair transition to new energy systems for communities and workers, one of our challenges is looking at existing oil and gas infrastructure, including pipelines, and how to diversify that infrastructure. In southern Manitoba, we have numerous oil and gas pipelines running through our lands. If you were raised in this region, you’re probably familiar with the pipeline corridor cutting through our communities here - running from the Saskatchewan border just south of Virden through communities including Morden, Winkler, and Gretna, among others, and into the US. This corridor has seven pipelines, all owned by the oil and gas corporation Enbridge. 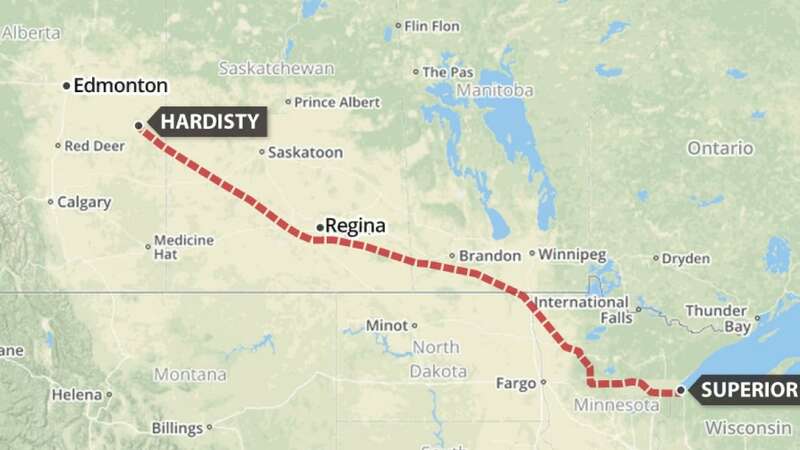 One of these pipelines is Enbridge’s Line 3, a 1,660km crude oil pipeline which travels from northern Alberta’s tar sands through Saskatchewan and Manitoba, and across the border through North Dakota, Minnesota, and Wisconsin. In operation since the 1960s, the Line 3 pipe has deteriorated substantially and is now operating significantly under capacity because of the aging and unstable infrastructure. Enbridge is now proposing to replace the pipeline, while expanding its capacity to nearly double and leaving the existing, decaying pipe in the ground. If built, the new Line 3 pipeline would transport 760,000 barrels of crude oil per day through Manitoba. That’s the equivalent of 48 olympic swimming pools full of oil, everyday. At an estimated $8.2billion, this would be the largest project in Enbridge’s history. Why should we be talking about Line 3? You’ve likely seen the piles of pipes stacked up along the corridor in recent months, in preparation for Line 3 construction in the spring. Since this multibillion dollar project is posed to run through our farmlands and waterways, it certainly warrants conversation. Is this the kind of energy infrastructure we want to develop in our province? As a concerned young person in Manitoba, I see this as a critical opportunity to talk about the infrastructure we are investing in, and how it relates to the broader energy challenges and opportunities we face as a society. What kind of energy systems do we envision for the future in Manitoba? What alternatives are possible for us as citizens and as a province? How can we design our energy systems in ways that consider the youth of today and future generations? As a student of biology, geography, and Indigenous studies, these are the questions I ask myself. To me energy justice looks like fair and equitable access to energy for all people, from systems that do not compromise the lands and waters for our children and grandchildren. This is why I am interested in thinking carefully and critically about the construction of new oil pipelines in this province. The impacts of our use of oil and gas are more apparent than ever and cannot be ignored. 2017 was the hottest year on record, and the latest of 16 consecutive record breaking years for global temperature. As the climate changes, we know to expect more extreme events like the wildfires that have swept Western Canada these past three summers, and the increasingly irregular precipitation affecting farmers’ yields here in Manitoba. Oil and gas contribute to these increasing impacts of climate change in addition to posing direct risks to our lands and waters through spills - witnessed most recently close to home with the spill of 5,000 barrels of oil from the Keystone pipeline in South Dakota last November. It is clear that we will have to move beyond fossil fuels at some point. The longer we wait, the more drastic the impacts of climate change will be, so why not start the conversation now? It is not a question of oil by pipes versus oil by rail. The question we should be asking is what comes after oil, and how do we make the transition collectively? If we look across the country and around the world, we see that the answers are emerging all around us - responsible hydropower, solar, wind, biofuels. The demand for diverse energy sources is rising as costs of production fall faster than predicted. We are at a moment in history, where we can choose to step forward or back. Faced with Enbridge’s biggest project ever, which would be a significant expansion to global oil infrastructure, we must get together to discuss whether this project is a step in the right direction. Are new pipelines in our best interests? What benefits and risks would the Line 3 expansion bring to Manitobans? These are the critical and difficult questions we must be asking in our communities. With construction slated to start mid-year, now is the time for discussion on Line 3. In the coming weeks, me and my friends from MEJC will put out more articles with information on the economics, risks, and rewards of Line 3. In coming months, we will be working with communities across southern Manitoba to organize townhall discussions on the issue to share information and listen to the thoughts and concerns of local citizens. We welcome anyone interested in contributing to these conversations to contact us at info@mbenergyjustice.org or through our Facebook page. This morning, we got the news we’ve all been fighting for! TransCanada has announced that they are cancelling their Energy East and Eastern Mainline pipeline proposals. This is truly a monumental victory for every Canadian. Today, we stopped 1.1 million barrels of crude oil per day—some of the dirtiest oil in the world—from being shipped 4,500 km across the country and burned, sending thousands of tonnes of greenhouse gases into the atmosphere. Today, we stopped ourselves from investing in antiquated infrastructure for the economy of the past. Today, we stood alongside Indigenous communities to defend Indigenous rights to their lands, resources, and livelihoods. Today, we stood up for the thousands of waterways that this pipeline would have crossed, the veins of our earth and source of our drinking water. How did we get to this point? This victory belongs to the people—to the front line communities, Indigenous nations, environmental organizations, and individuals who have stood up against this project since it was first announced by TransCanada in 2013. We raised our collective voice to government and industry to denounce the pipeline as incompatible with a safe climate and future. We elected a government on the promise to include climate impacts in the pipeline review process. We stood up at town halls across the country and spoke the truth—that this project is not in the best interest of Canadians. We did it together, and today we celebrate together. What have we learned? This victory shows us that people, organized and united, have the power to speak louder than industry. When we come together and combine our unique skills, energies, and perspectives, we have the power to cut through the propaganda of the fossil fuel industry and shift the public narrative on energy in this country. And we see that as we lead, the government follows.